The major indexes were awash with red ink last Friday as fears of a global economic slowdown was compounded by market noise of an inverted yield curve blaring from the bond community. To former Federal Reserve Chairman Janet Yellen, this shouldn’t sound the trumpet on a recession, but a rate cut. “I don’t see it as a signal of recession,” Yellen said during a question and answer session at the Credit Suisse Asian Financial Conference. Last Friday saw the short-term 3-month and longer-term 10-year yield curve invert, which hasn’t been seen since 2007–just ahead of the financial crisis. This helped send the Dow Jones Industrial Average south by 460 points. 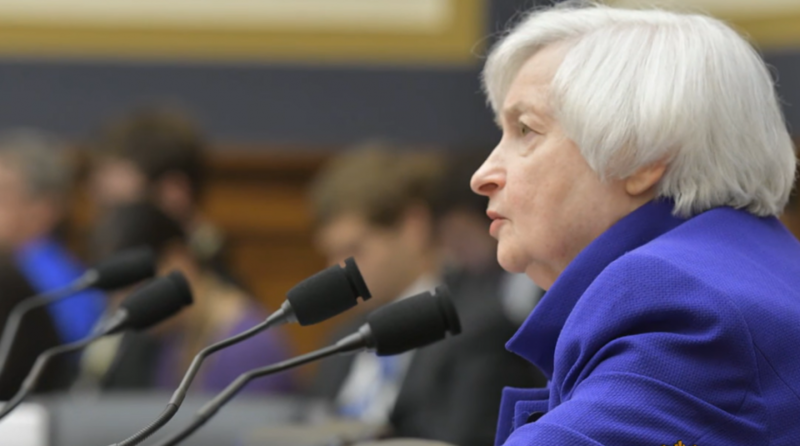 Yellen’s assessment comes after the central bank’s decision to keep interest rates unchanged last week. In move that was widely anticipated by most market experts, the Federal Reserve on Wednesday elected to keep rates unchanged, holding its policy rate in a range between 2.25 percent and 2.5 percent. In addition, the central bank alluded to no more rate hikes for the rest of 2019 after initially forecasting two. Fears of a global economic slowdown affecting the markets were on the central bank’s mind. Recently, results from a survey of central bank respondents revealed that gross domestic product is expected to slow to a 2.33 percent rate of growth this year after initially forecasting 2.44 in January. “The U.S. is certainly experiencing a slowing of growth,” Yellen said. According to Yellen, however, GDP won’t slow enough to a point where it reaches a recessionary pace.